This marks the first of several blog posts that will focus on Executable and Linkable Format (ELF) files. In this series, we’ll introduce various topics, ranging from the basics of ELF files built upon Linux malware technologies such as infection vectors, custom packer techniques and common malware practices like dynamic API resolving techniques or ELF header crafting. The overall goal of the series is to help both advanced and beginner Linux users to acquire a sound knowledge of ELF files, along with improving their understanding of the threat landscape in Linux systems. Why focus on ELF? Our team is preparing for its flagship product, Intezer Analyze, to be able to support these files. Because malware also strikes Linux systems–and it can often happen through this file type–we thought it would be a helpful place to start. EI_PAD: Start of padding bytes. e_entry: Entry point of application. e_phoff: File offset of the Program Header Table. e_shoff: File offset of the Section Header Table. e_flags: Processor-specific flags associated with the file. e_phentsize: Program Header entry size in Program Header Table. 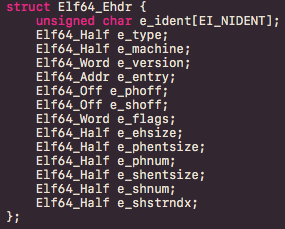 e_phnum: Number of Program Headers. e_shentsize: Section Header entry size in Section Header Table. e_shnum: Number of Section Headers. e_shstrndx: index in Section Header Table Denoting Section dedicated to Hold Section names. In order to preview these fields for a given ELF binary, we can use any ELF parser of choice. A common tool to quickly parse ELF files is the readelf utility from GNU binutils. sh_name: index of section name in section header string table. sh_addr: virtual address of section. sh_offset: section offset in disk. sh_entsize: size of entries contained in section. .plt: PLT (Procedure Linkage Table) (IAT equivalent). .got: GOT entries dedicated to dynamically linked global variables. .got.plt: GOT entries dedicated to dynamically linked functions. .dynamic: Holds all needed information for dynamic linking. .dynsym: symbol tables dedicated to dynamically linked symbols. .strtab: string table of .symtab section. .dynstr: string table of .dynsym section. .rel.dyn: global variable relocation table. 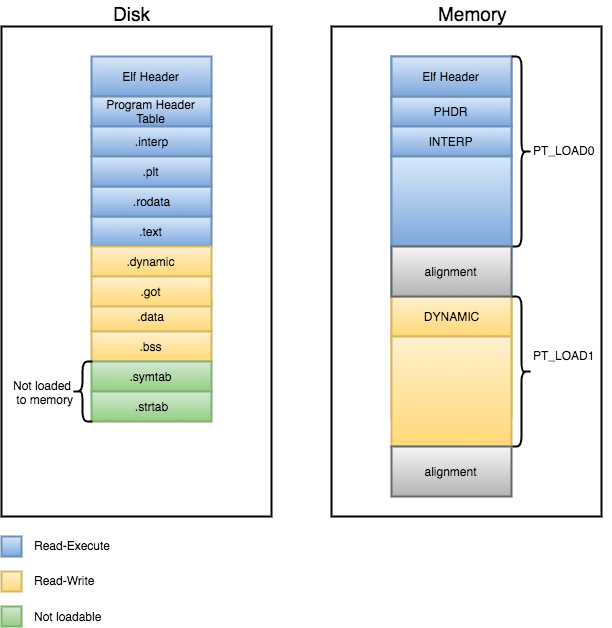 Segments, which are commonly known as Program Headers, break down the structure of an ELF binary into suitable chunks to prepare the executable to be loaded into memory. In contrast with Section Headers, Program Headers are not needed on linktime. p_offset: File offset of segment. p_vaddr: Virtual address of segment. p_paddr: Physical address of segment. p_filesz: Size of segment on disk. p_memsz: Size of segment in memory. P_align: segment alignment in memory. PT_NULL: unassigned segment (usually first entry of Program Header Table). PT_INTERP: Segment holding .interp section. PT_TLS: Thread Local Storage segment (Common in statically linked binaries). Something important to highlight about segments is that only PT_LOAD segments get loaded into memory. Therefore, every other segment is mapped within the memory range of one of the PT_LOAD segments. In contrast from other File formats, ELF files are composed of sections and segments. As previously mentioned, sections gather all needed information to link a given object file and build an executable, while Program Headers split the executable into segments with different attributes, which will eventually be loaded into memory. Another important aspect of segments is that their offsets and virtual addresses must be congruent modulo the page size and their p_align field must be a multiple of the system page size. The reason for this alignment is to prevent the mapping of two different segments within a single memory page. This is due to the fact that different segments usually have different access attributes, and these cannot be enforced if two segments are mapped within the same memory page. Therefore, the default segment alignment for PT_LOAD segments is usually a system page size. The value of this alignment will vary in different architectures. We’ve covered the basic structures to understand the major components in ELF executables, and have discussed the different fields of Segments and Sections and the relationship between them. 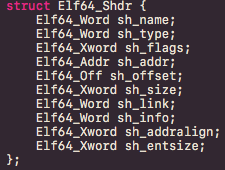 In our next post, we’ll dig deeper into the ELF file structure by covering how Symbols and Relocations are handled.